This may be the first image of Eriniya Imythess that I've posted... hmm, well, I do like this drawing. It's a little older (when I say older, I mean like 4 months ago), and I wasn't really careful with finishing sketches, so it did take some refurbishing, but I loved the way it turned out. 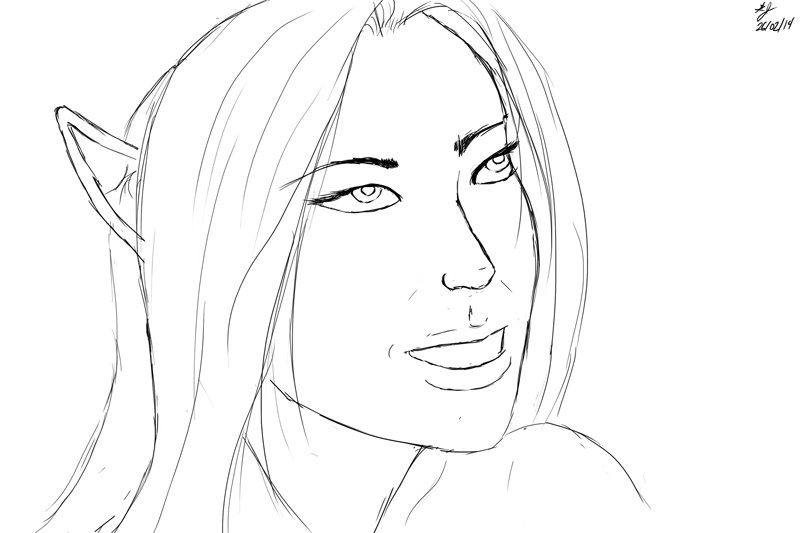 Being an anthro artist for the most part, I've struggled a bit with human faces, particularly the nose and mouth. I did find a very handy tutorial for how to shape the nose properly since then so it helped in refurbishing it. Anyhoo, Eriniya is one of Bors' priestesses, actually a Matriarch (equivalent to Sabine's rank within his faith's hierarchy), and his personal valet. She's a Drow elf from Bors' home plane of Jura. There's a sizeable Drow contingent of Borsites, given the way traditional Drow society is so fucked up when it comes to interpersonal relationships, and the Borsites are one of the few faiths openly accepting of them on Jura. Eriniya happened to be one of them that fled the underground to the surface. She found herself in Bors' favour and regularly... worships her chosen deity in the typical way. I think she looks really cute in this picture.